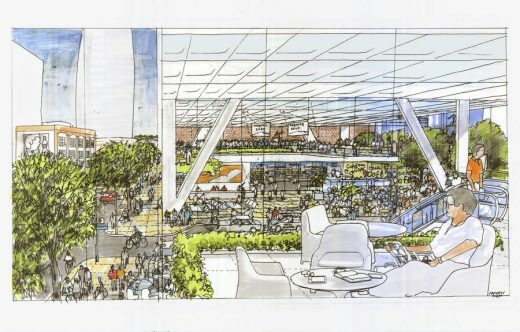 Proposal to convert an ageing shopping centre in California’s Silicon Valley into a vast development featuring the world’s largest roof garden. The plan is to develop the Vallco Shopping Mall in Cupertino into a mixed-use development featuring a 30-acre (12 hectare) green roof. The Hills at Vallco Scheme would occupy a 50-acre (20 hectare) site in the heart of Silicon Valley between Apple’s One Infinite Loop headquarters and the Foster+Partners-designed Apple Campus 2, reports Dezeen. The Hills at Vallco development features a 30-acre community park and nature preserve, which will not only be the largest community park in Cupertino, but also the largest green roof in the world, said a statement from Sand Hill Property Company, the developer behind the $3 billion (£2 billion) scheme. The undulating green roof – designed to buffer the partial residential scheme from neighbouring industrial estates – would be crossed by a 3.8-mile network of walking trails. Vineyards and orchards, an amphitheater, playgrounds and banks of native planting to attract local wildlife would also be hosted on the roof. Up to 800 apartments, 185,000 sqm of office space and a new shopping centre containing a cinema, bowling lanes, an ice rink and gym are intended to site below the green roof. The development would take the place of the existing Vallco Shopping Malls, which has recently seen the closure of key brands Macy’s and Sears, while its lower level has been closed for over a decade. Sand Hill acquired the site from its four separate owners earlier this year. Plans for the scheme will be submitted to the City of Cupertino in the coming weeks and a public consultation is currently running on The Hills at Vallco website. The Uruguayan architect also designed the 432 Park Avenue skyscraper in New York, which is scheduled to complete later in 2015. Rafael Viñoly is the architect behind London’s controversial Walkie Talkie building.